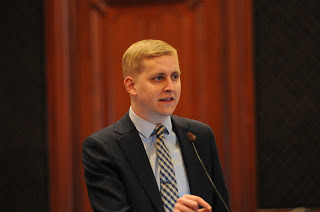 Dixon…State Representative Tom Demmer (R-Dixon) on Friday lauded the House passage of SB 2059, which provides over $600 million in stopgap funding to Illinois institutions of higher education, including interim support to community colleges and MAP grant recipients through existing state funding. Rep. Demmer went on to urge stopgap funding to remedy similar issues in Human Services as well. “As a member of both the House Human Services Committee and the House Human Services-Appropriations Committee, I understand there are many similar challenges facing the human services safety net. We should take this momentum and next apply it to human services and a full budget solution,” said Rep. Demmer The stopgap higher education funding measure provides nearly $170 million in funding to MAP recipients, $74 million to community colleges, and $26 million to nearby Northern Illinois University. “I appreciate that this stopgap funding measure was driven by rank-and-file members and I hope we can use this momentum to break through this impasse and begin to remedy the dire fiscal situations facing our state,” continued Demmer.